Recently, in my practice I've been exploring ONE BREATH AN ASANA, holding the state of the asana while exploring an appropriate kumbhaka. Note: You don't necessarily have to change your whole practice to explore this approach, you might start with one asana, paschimottanasana say. In Yoga Makaranda ( Mysore 1934) Krishnamacharya doesn't talk about taking five, eight or ten breaths in an asana but rather about staying in the asana as long as possible while taking an appropriate kumbhaka ( holding the breath in or out following the inhalation or exhalation respectively). Note: I don't tend take kumbhaka in twists (Krishnamacharya seems to avoid suggesting this although he does include kumbhaka's in bharadvajrasana) but rather, slow the inhalation and exhalation still further to around 10-30 seconds each. However, Krishnamacharya talks of a LONG STAYS in certain key asana. How to square a long stay with one breath? 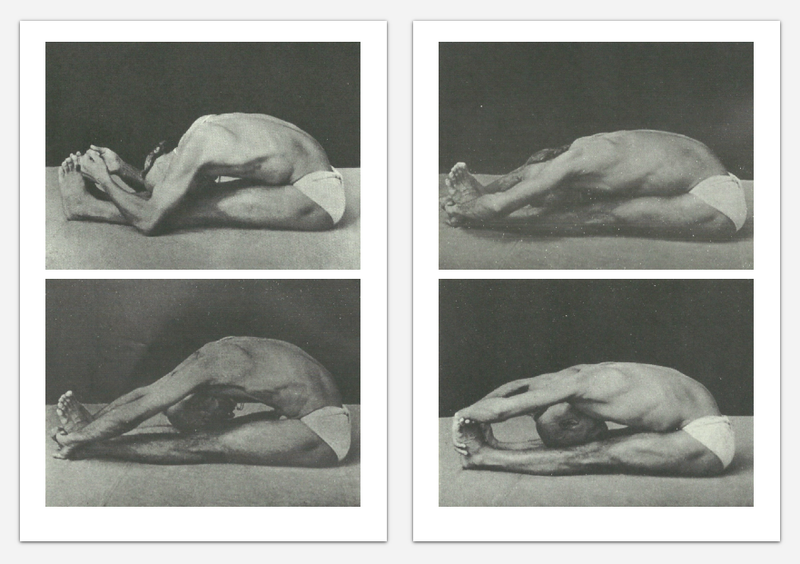 In certain key asana, Krishnamacharya indicates possible head and/or hand variations for the asana. In, key asana, like for example paschimottanasa, Janu Sirsasana, Sarvangasana, Sirsasana, we might employ a variation, taking our kumbhaka for each variation. 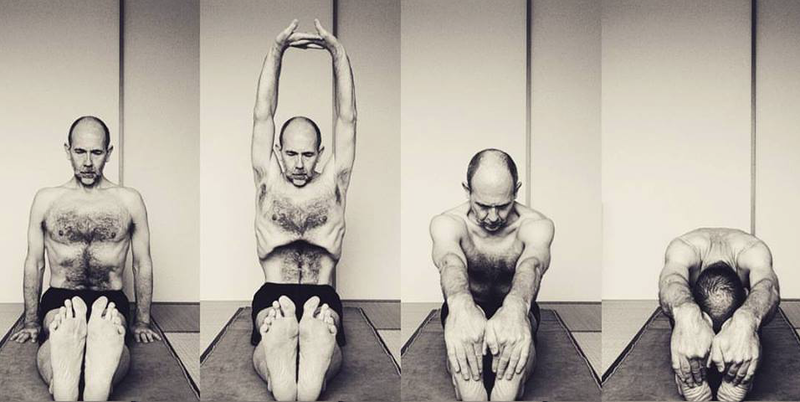 In the case of full vinyasa Paschimottanasana, a 30 second kumbhaka taken after the inhalation in dandasana, 30 second kumbhaka's taken after the exhalations with the forehead, chin and face on the knee repeated for each hand variation ( holding the toes, holding the outside of the feet, holding the wrists around the feet, hands over the feet) and 30 second kumbhaka taken after the inhalation, takes TEN minutes. One breath one asana but also a long stay. In this approach to practice, we might choose to practice ten to twelve key asana ( half of an edited Ashtanga primary series ) in the same time it takes to practice the fifty or so asana of a regular Ashtanga Primary series, which doesn't, under Jois, include kumbhaka or (any longer ) the slowing the breath. Is this a 'Rishi' series? 'Originally there were five series: Primary, Intermediate, Advanced A, Advanced B, and the fifth was the “rishi” series'. '...Doing a practice of 10 postures for up to 50 breaths is a method of preparing for "advanced series" after one has learned 1st and 2nd. It can be done once or twice a week. One does the "salutations" and then starts going thru the series, holding each posture for as long as comfortably possible. Notice which postures could be held for 50 breaths. The next time you practice this way, the postures which you could hold for 50 are omitted and new ones are added at the end. One gradually works thru the series, dropping and adding asanas, still doing 10 asanas per session. I have gone all the way thru 1st and 2nd this way several times over the years and have found it beneficial'. 'Then, once one has mastered all of the asanas, one can practice "the rishi series", the most advanced practice. One does the 10 postures that one intuits will be the most beneficial and appropriate for that day, holding each posture for up to 50 comfortable breaths'. Jois talked ( in the 1970s, to Nancy Gilgoff and David Williams) of a Rishi series, an advanced approach to asana, where we stay for fifty breaths in ten asana. Jois, however, either wasn't taught to practice kumbhaka in asana other than in pranayama ( he was a boy after all, when a student of Krishnamacharya) or he decided against the practice his teacher presented in his key early texts of the period that Jois was krishnamacharya's student. If, however, we reintroduce kumbhaka, one breath an asana over around ten asana, we have perhaps a practice worthy of a Rishi. Krishnamacharya wrote that in the kumbhaka we see god (the infinite?). Kumbhaka is the state/space (an "infinity of infinities". Cantor) between two points, the end of the exhalation and the beginning of the inhalation or the end of the inhalation and the beginning of the exhalation. Or perhaps, as the experience of the kumbhaka's seem to join up throughout our practice we experience peace, a sense of well being, sufficiency, the latter might also called... samadhi. NOTE: After reaching fifty, Pattabhi Jois suggested in Yoga Mala that that we might approach practice 'however or whatever we damn well please' ( I paraphrase). But really, why wait that long. Caution: Kumbhaka is an advanced practice ( but perhaps with more of a point to it than an advanced series). Before exploring introducing kumbhaka you should be sure there is no health issues that might counter indicate it, heart issues for example, check with your doctor perhaps. You should probably have been exploring slowing the breath and been practicing regularly for some time, daily practice for three months say or three times a week for six months and so on. Explore simple pranayama outside of your asana practice and when beginning to introduce kumbhaka into your asana practice begin with short kumbhaka's of 2 seconds duration and build up slowly from there. Breathe to the abdomen, work on relaxing in your asana, during your kumbhaka.let any tension drop away. Counting can help in the beginning, or mentally chanting a suitable length mantra but eventually you will want enjoy the space between the stages of the breath unhindered. Full vinyasa, starting at Samastithi. 20-30 second Kumbhaka after the inhalation (holding the breath ). 1a. Take the toes, exhale, fold, draw in the belly, FOREHEAD to knees. 1b. Take the toes, exhale, fold, draw in the belly, FACE to knees. 1c. Take the toes, exhale, fold, draw in the belly, CHIN to knees. 2a. Take the outside of the feet, exhale, fold, draw in the belly, FOREHEAD to knees. 2b. Take the outside of the feet exhale, fold, draw in the belly, FACE to knees. 2c. Take the outside of the feet, exhale, fold, draw in the belly, CHIN to knees. 3a. Take hold of the wrists around feet, exhale, fold, draw in the belly, FOREHEAD to knees. 3b. Take hold of the wrists around feet, exhale, fold, draw in the belly, FACE to knees. 3c. Take hold of the wrists around feet, exhale, fold, draw in the belly, CHIN to knees. 4a. Take the hands over the feet, exhale, fold, draw in the belly, FOREHEAD to knees. 4.b Take the hands over the feet, exhale, fold, draw in the belly, FACE to knees. 4c. Take the hands over the feet, exhale, fold, draw in the belly, CHIN to knees. With Guru Purnima tomorrow, I thought why not add some of Krishnamacharya's guidelines for asana practice to my post from his Yoga Makaranda (Mysore 1934), back when the young Pattabhi Jois was his student. This was Krishnamacharya's first text and for all he knew perhaps the only text on yoga he would ever get to publish. This is what he wanted to say perhaps about how asana should ideally be practiced. "In yogabhyasa, there are two types of kriyas — langhana kriya and brahmana kriya. One who is obese should practise langhana kriya. One who is thin should practise brahmana kriya and one who is neither fat nor thin should practise yogabhyasa in both. Brahmana kriya means to take in the outside air through the nose, pull it inside, and hold it in firmly. This is called puraka kumbhaka. Langhana kriya means to exhale the air that is inside the body out through the nose and to hold the breath firmly without allowing any air from outside into the body. This is called recaka kumbhaka". "Those who ignore these rules and only do yogabhyasa according to their wishes, by following picture books, will be unhappy as a result because they will obtain absolutely no benefits from this". "Ordinarily during the Yogasana practice, the breathing should be with a rubbing sensation at the throat, long and thin. See Hatha Yoga Pradipika, ch.III slokas 51-53. It is called ANULOMA UJJAYI. The benefit in this kind of breathing is that we overcome cough, have good appetite, improved circulation of blood in the lungs, liver, spleen and kidney, in the glands and in the joints of bones. The methods of breathing can be practised by all people at all times". "This asana has many kramas. Of these the first form has 16 vinyasas. Just doing the asana sthiti by sitting in the same spot without doing these vinyasas will not yield the complete benefits mentioned in the yoga sastras. This rule applies to all asanas. The first three vinyasas are exactly as for uttanasana. The 4th vinyasa is caturanga dandasana, the 5th vinyasa is urdhvamukhasvanasana, the 6th vinyasa is adhomukhasvanasana. Practise these following the earlier instructions. In the 6th vinyasa, doing puraka kumbhaka, jump and arrive at the 7th vinyasa. That is, from adhomukhasvanasana sthiti, jump forward and move both legs between the arms without allowing the legs to touch the floor. Extend the legs out forward and sit down. Practise sitting like this with the rear part of the body either between the two hands or 4 angulas in front of the hands. It is better to learn the abhyasa krama from a guru. In this sthiti, push the chest forward, do puraka kumbhaka and gaze steadily at the tip of the nose. After this extend both arms out towards the feet (the legs are already extended in front). Clasp the big toes of the feet tightly with the first three fingers (thumb, index, middle) of the hands such that the left hand holds the left big toe and the right hand holds the right big toe. Do not raise the knees even slightly. Then, pull in the stomach while doing recaka, lower the head and press the face down onto the knee. The knees should not rise from the ground in this sthiti either. This is the 9th vinyasa. This is called pascimottanasana. In the beginning, everybody will find it very difficult. The nerves in the back, the thighs and the backs of the knees will feel as though they are being fiercely pulled and this will be extremely painful. The pain will remain for 8 days. After this, the pulling on the nerves will release and it will be possible to do the asana without any problem. This pascimottanasana has many forms. After first practising this asana with the face pressed onto the knee, practise it with the chin placed on the knee and then eventually with it placed 3 angulas below the knee on the calf. In the 10th vinyasa raise the head. In the 11th vinyasa, keeping the hands firmly pressed on the ground, raise the entire body of the ground and balance it in the air without touching the ground. The 11th vinyasa is called uthpluthi. The 12th vinyasa is caturanga dandasana. The 15th is the first vinyasa of uttanasana. The 16th vinyasa is the 2nd vinyasa of uttanasana. Afterwards, return to samasthiti. You should learn the intricacies of this vinyasa only from a guru. Benefit: This will cure all diseases related to the stomach. This asana can be done on the floor or on a mat according to the capabilities of one’s body. 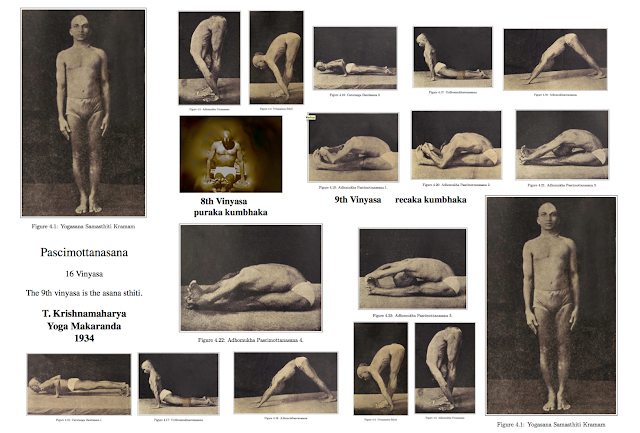 Learn some of the other forms of pascimottanasana krama by studying the pictures carefully. Pregnant women should not do this asana. But this can be done up to the third month of pregnancy. For men, there are no restrictions to practising this asana. If this is practised every day without fail for 15 minutes, all the bad diseases of the stomach will be removed".